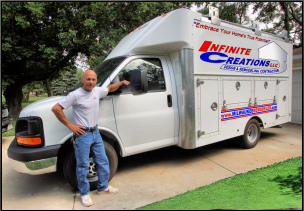 Infinite Creations LLC of Brookfield, WI specializes in Kitchen & Bath Remodeling and Basement Finishing. Our versatility also allows us to offer a wide range of General Home Improvements. Along with our trusted team of electrical and plumbing contractors, we complete renovation projects both large and small in a timely manner. From initial contact through the completion of your project we can take care of everything from start to finish. Our goal is to deliver an enjoyable remodeling experience alongside results you’ll enjoy for years to come. Combining innovative design concepts, quality workmanship, attention to detail and great communications we strive for excellence while making your remodeling dreams become a reality. Every home owner’s needs are different and every project is unique in its own way. Whether you are looking for minor home repairs or are planning a major home remodeling project, we can help! Dependable: Great communications and the ability to follow through are an integral part of any good remodeling experience. We’ll be on site every scheduled work day and consistent in relaying scheduling and informational updates to you, the homeowner. Knowledgeable: We’re entering our 20th year as a remodeling contractor. We strive to provide results that you’ll be able to enjoy for years to come. Our experience in home remodeling is an asset you can count on! Quality Craftsmanship: We take great pride in the quality of our workmanship. Budget can play a large roll in the variety of options available for your project, so we’ll help guide you through the decision process to determine the results that will best suit your needs. Creative: Blending our clients desires with creative design and imagination, the planning phase is delivered in part with 3D renderings. As a result we’re able to work together to create a unique space that you will truly enjoy. Visit us on FaceBook to see more recent projects we have done.